On Thursday July 15, 1994, President Paul Biya signed decree No. 94/125 announcing the privatization of the CDC. There was an instant wave of anger across Anglophone Cameroon, particularly in Fako division where the indigenous population had not been informed of the planned privatization. As soon as the decree was made public Bakweri political, traditional and other leaders mobilized to revive the moribund BLC and to adopt a common position with regards to the privatization, which had planned without the slightest consideration to the Bakweri land problem. On July 23, a crisis meeting chaired by Paramount Chief S.M.L. 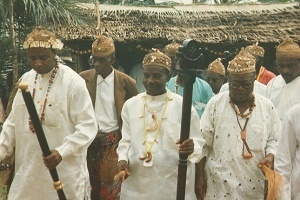 Endeley of Buea and Paramount Chief F. Bille Manga Williams of Victoria was held in Buea. The meeting, which brought together 150 representatives of the Bakweri, Mungo and Isubu clans,convened to discuss the implications of the decree. At the end of this historic reunion an ad hoc Committee was appointed by the assembly with the objective of working with the Bakweri Land Claims Committee to prepare a detailed memorandum on the Bakweri position, and "to pursue relentlessly at all levels this matter of privatization or sale of the CDC". Kofele-Kale as Secretary; and Mr. G. B. Mbua Mofoke, Mr. Mokake Elali, and Chief Mbella Sonne Dipoko. In a resolution published at the end of the meeting, the Bakweri challenged the planned privatization and stated that “ the land and natural resources being exploited by the CDC belong to the indigenes of Fako and cannot therefore be alienated and/or transferred to non-natives”.